Need to Connect With Your Customers? Leave it to the Doctor! This is the first bracelet camera with fitness tracker call reminder function. Multi-purpose: video recording, taking photos, watch time, track steps, App notification etc. High resolution: full HD 1080P/30 fps crystal video quality. Portable mini size is very convenient for outdoor activities. 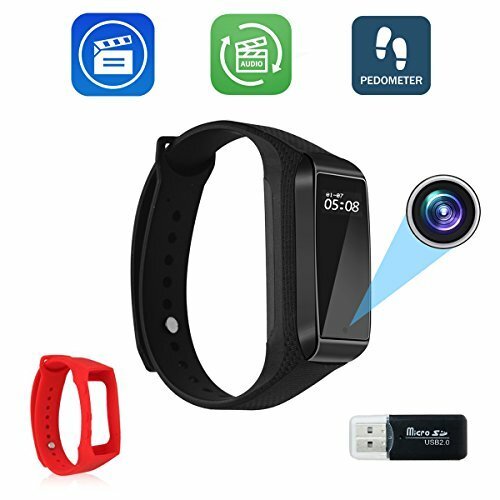 Wearable Camera: The lens is on the screen of the bracelet, so it records video without anyone's notice, which is really fashionable and funny, suitable for interview, entertainment, home security and outdoor activity, etc. Crystal Video Quality - Full HD 1080P: High definition HD intelligent bracelet cam with FULL HD video recording resolution of 1920x1080P/30FPS and photo resolution is 2560 x 1440. Tips: The package comes with screen protective film; you can remove it before shooting, so it will bring even clearer picture quality! Easy Set Up, Portable, Comfortable and User Friendly: 3 keys to be operated, switch to video record, photograph and smart band function. Exquisite and adjustable silicone wristband fits wrist of everybody. High Sensitive Lens Workable in Low Illumination: High light-sensitive lens can work at low light environment. Vibrating alert when you click a button let you know whether you operate successfully or not. If you have any questions about this product by Bysameyee, contact us by completing and submitting the form below. If you are looking for a specif part number, please include it with your message. © 2019 - drjcurran.com. All Rights Reserved.